"It doesn't really matter who is behind the wheel, as long as he is responsible like she is." Judo: Silver medal for Sagi Muki and bronze medal for Peter Falchuk at Paris Grand ?? Two Israelis were killed and 51 were injured in a traffic accident when a bus collided with a rescue vehicle on the West Bank ['Apartheid Road' - OH] 443 highway that goes through the West Bank, connecting Modiin and Givat Zeev to Jerusalem. Labor Is Dead, and There's Only One Way to Revive It (Avraham Burg, Haaretz+) Keeping it alive by artificial means will only humiliate the suffering patient and obscure its former greatness. Fear and loathing in the Labor Party (Nahum Barnea, Yedioth/Ynet) Labor may have ended its historical role, but this is not the time to put it aside. When casting their ballots in the party's primaries, its voters must think about the center-left bloc and the day after the elections. These Politicians Are Instagram Stars. But Can They Save Their Party? (Allison Kaplan Sommer, Haaretz+) While Merav Michaeli and Stav Shaffir campaign for Labor ahead of Monday's primaries, both women already have their sights set on a post-Gabbay future. Do Israelis vote for political ideology or cult of personality? (Dahlia Scheindlin, +972mag) Although Israelis have historically voted for strong political frontmen, it seems that dazzling personalities are no longer sufficient to winning elections. It turns out that voters are looking at the values, worldview, and policies. Et tu, Benny? (David M. Weinberg, Israel Hayom) Lt. Gen. Gantz seems to be suggesting unilateral withdrawals and another disengagement. This is frightening and clarifying. Judicious conflict management requires a steady hand at the helm of state. “Zero leadership, zero management ability": the shocking testimonies from Gantz's cyber company (Ben Caspit, Maariv) Gantz's term in the cyber company, Fifth Dimension, shows a picture of a weak sluggish chairman devoid of initiative or independent drive, which turned into the marionette of the dominant CEO. And that's not all. The loyal: Once again Likud members declare they will apply (Israeli) sovereignty in Judea and Samaria, but talk is easy (Prof. Aryeh Eldad, Maariv) As in every primaries, members of the ruling party swear to the Greater Land of Israel, but their party has been in power for 32 years, and one grain of land has not been annexed, so should we believe in words or deeds? Memo to the Israeli Left: Learn From Trump (Tzvia Greenfield, Haaretz+) Contrary to the media propaganda against him, hated American president knows how to formulate new approaches that can change reality. 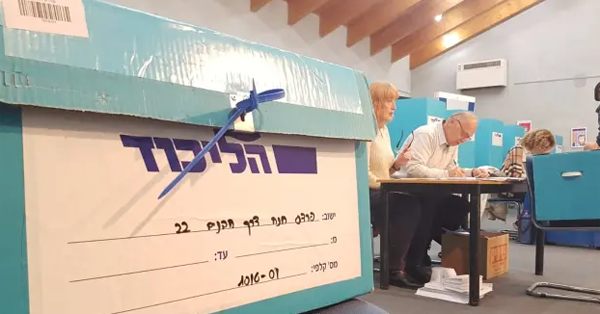 Tehran eyes Israel's elections (Prof. Eyal Zisser, Israel Hayom) Iran wants the current Likud government to fall and at the very least to deter Israel from continuing the campaign against its entrenchment efforts in Syria. In the meantime, this hasn't been working. Tibi, as an Arab politician in Israel, you can’t be half pluralist (Odeh Bisharat, Haaretz+) As election nears and with the Joint List splitting up, why should only one Arab party behave responsibly while the other is free of that burden? Restore Wadi Ara Train Line Plan (Haaretz Editorial) Israel neglects the area, whose residents suffer a transportation crisis, because most of them are Arabs. Minorities complain of humiliating (security) checks? Go complain to the terrorists (Meir Uziel, Maariv) I once suggested that every airport in the world have huge signs: "We are sorry, because of Arab terror we must make checks and make you uncomfortable." The same sign should also be on the Separation Wall. (Uziel writes about an Op-Ed in Haaretz in which a young Bedouin man from the Negev named Mahmoud described how he was pulled out of the line to visit the coffin of writer Amos Oz in Tel-Aviv because he was dark-skinned.) Mahmoud, I am furious that the accumulated experience requires suspecting that a person who looks like you may commit an act of terror. Because of the terrorists, everyone must defend himself. It is interesting that not one of the people who commented on the article on the internet understood this, nor no one was angry like I was over this injustice. The Right Yearns to Oust the Palestinians. The Left Must Stop It (Amira Hass, Haaretz+) Our role on the left is not to compete in verbal radicalism or to argue over whether there will be another mass expulsion and whether it will devolve into mass murder; our role is to thwart such a horrific scenario. The death penalty for terrorists is important for the security of citizens - so why did Habayit Hayehudi thwart the legislation? (Attorney Ilan Katz, Maariv) The horrific murder of Ori Ansbacher raises the issue of the death penalty - which was approved in the past, but was thwarted by the former party of Naftali Bennett and Ayelet Shaked. Hope passes to the next Knesset. Gantz was wrong on the Gaza war (Yossi Yehoshua, Yedioth/Ynet) The former chief of staff should have been honest about the military's shortcomings during the 2014 conflict, in particular the failure to identify the real and immediate threat posed by Gaza's attack tunnels. First Israel Suffocates Gazans, Then We Say We're Worried About Their Fate (Amira Hass, Haaretz+) Total denial of responsibility for the dire situation of Gaza's healthcare system proves Israeli politicians aren't prepared to embrace a different policy than the one bound to bring about mass civilian casualties in war. In the 85 years since Egged was founded, Hamad is the first Muslim woman driver from East Jerusalem. Her employment happened quite by chance. She heard about a course run for East Jerusalem residents by the "Ryan" Center of the Ministry of Social Affairs, and was enthusiastic. "I said to myself, Why not, really? Women are already flying planes, why shouldn’t I drive a bus?" Most of the passengers on Hamad's bus try to put the politics and prejudices aside, and try to enjoy the refreshing look of a woman wearing a headscarf at the driver's seat. "She drives well, that's what matters," said one of the passengers. Another passenger said that "it does not really matter who is behind the wheel, as long as he is responsible like she is.” Hamad says she never dreamed of being a professional driver. The circumstances of life led her to become the first female Muslim driver in Egged. "A few years ago, my husband was forced to leave his job as a construction worker due to a work accident, and we lived off of 1,000 shekels a month, which was not enough. I arrived at the Ryan Center, where I was allowed to take a bus driving course,” she said. No one but her husband knew she was taking the course. Even when she began to drive in the city, she decided to keep it to herself out of fear of reactions in East Jerusalem. "My extended family did not even know," she says. One day, however, she was photographed and her picture was distributed in the media in the eastern part of the city. One question was on the picture: "Who is the female driver with the headscarf who works at Egged?" The reactions in East Jerusalem and beyond the Green Line were divided. Some encouraged her and some less so, but Hamad, who decided to break the glass ceiling, did not allow the reactions to affect her. "I do not care what they think, and the moment I realized I had to work, I cut myself off from everything and went to bring my livelihood home," she said. Hamad also says that the company's drivers, including the Jews, have already accepted her as a daughter and encourage her. These days she is working on improving her Hebrew, especially on the words she will need to use in work. She also tries to get used to the fact that she is not in one place all the time and has to wander between her places of prayer. "Sometimes I even pray on the bus," she admits, and says that Egged even gave her a room for prayer. "I see myself as a symbol," Hamad says, "My sitting behind the wheel can encourage other women in our sector to go out and join the labor market.” When asked about fear that a terrorist could carry out an attack on her bus, she dismisses the question and says, "Every time I hear about violence against drivers or terror attacks, it's frightening. But everything is from above.” The "Ryan" Center of the Ministry of Labor and Social Affairs is designed to assist in the direction of employment for the Arab population, and works together with the Ministry of Jerusalem Affairs and the JDC Israel. The Center assists in the study of a training course for those who can not afford the course themselves.